Looking deeply is a question of scale: How close? How far? It may not matter; you might see the same thing. Shivering Sands, Single channel video (still), 21’, 2016. In a present where the effect of human’s impetus on the planet as a whole is in deep question, circulation and debate, Rohini Devasher’s exhibition: Archaeologies of the Future emphasises on the role of observation, speculation, leisure and wonder in making sense of the world. Titled after the iconic book by Frederic Jameson, the exhibition projects a temporal and conceptual journey about the future, by bringing together a constellation of stories on skies, seas, observatories, forts and forests. The scope of this coming together ranges from; an expedition to the abandoned sea forts in the North Sea that were built during the Second World War; a radio telescope experience at the Gauribidanur Observatory near Bangalore in India, and the aerial grazing of an ecosystem as it gradually shifts its course from darkness to light and vice versa. The exhibition builds on the artist’s interest in the intersection of art and science fuelled by her longstanding involvement with the Amateur Astronomers Association, Delhi , since 1997. Also referred to as the ‘citizen scientists’ these amateur astronomers inhabit a different temporal structure: one that works in contrary to the professional, goal oriented study of the sky and the space. It’s a process of looking that emphasises: experience over result, speculation over control and imaginary over the real. The threads that began then, come about in different ways in Archaeologies of Future arguing that the premise of experiential, speculative and the imaginary in relation to the world outside, can open up a new set of conversations and relationships that we have not yet before anticipated or foreseen. For Instance: Devasher's recent visit to the North Sea in England introduced her to a collection of former sea forts and army bases named the Maunsell Forts. Built in 1943 and decommissioned since the 1950’s, these structures still continue to posses a presence, in spite of their active lives as army centers ceasing. In the film and print series titled: Shivering Sands, Encounters of the Remote Kind and Field Notes, the artist re-contextualises these structures outside of their real existence. She imagines them as tripods docked literally in a no-man’s zone, as astronomical observatories grazing the sky from the position of the sea. The film’s engagement with the Maunsell Forts becomes both an entry into the past and the future, at once referencing the sociality of a life passed, whilst at the same time, speculating fresh and imaginary vantage points, for the future to come. The methods of the speculative and the imaginary take on a different role in: Atmospheres. A work where Devasher stages an alternative perspective to the 1970’s discovery of the Blue Marble , the image that captured the Earth as seen from the outer space. Whilst at the Gauribidanur Observatory near Bangalore, the artist realised that when her fish-eye lens pointed at the zenith, the sky is transformed into a sphere, thus mirroring the famous image of the Blue Marble. Instead of perceiving the Earth from outer space and in zero gravitational condition, this structure of viewing from within the earth is a frame configured by the changing colours of the blue sky, the passing clouds and the birds that stop by. Atmospheres, Single channel video (stills), 6’ 56”, 2015. The work Terrasphere, re-orients this circular frame of viewing by zooming into a mass of land; a forest like biosphere that is growing inside a spherical glass enclosure. Revisiting the 1960’s provocation by Ursula K. Le Guin: ‘the word for the world is forest’ , the work loops the intricacies of a constructed green mass as it appears and dissolves in various degrees of moisture, changing its course from the light to the dark, day to the night. The work extends the possibility of viewing the planetary whole not just as a blue sky but also as green land in its diverse associations with the forces at play in time that we live in. The work here opens a new horizon where our perceptual fields informed by astronomical observations can be re-focussed and imagined anew. 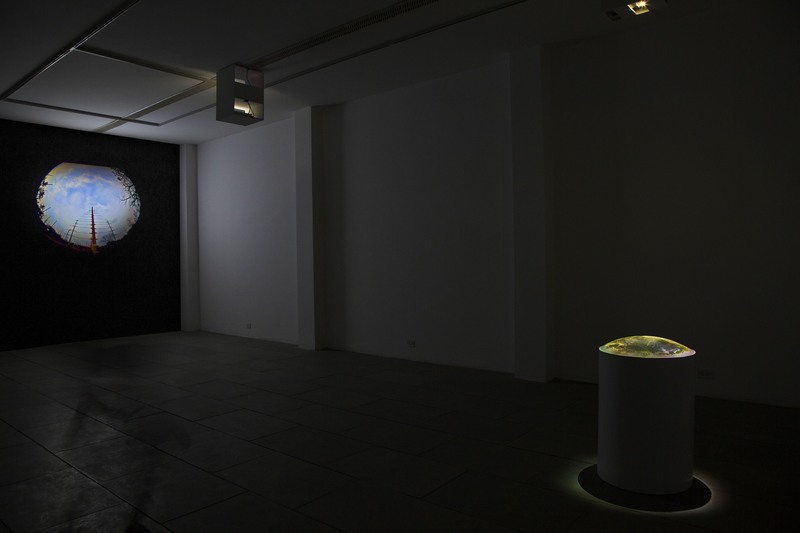 Terrasphere, Single channel video and wooden pedestal surmounted by poly-carbonate mirror dome, 24inch (diameter), 10’, 2015. Image Credit: Amit Mehra. The set of conversations anchored in this exhibition shift the perceptions around sea forts, blue planets and green masses, to open up new force fields where the proven trajectories between ‘nature and culture, perception and production’ are revisited and reviewed. Operating in a time where a significant ratio of the political and cultural sphere is concerned about the future of the planet’s precarity, Archaeologies of the Future by Rohini Devasher excavates a different route. One that argues for: observation over agenda, speculation over impact and wonder over anxiety. Laura Raicovich, At The Lightning Field, See: http://x-traonline.org/article/at-the-lightning-field/ (Accessed May 18, 2016). Edited excerpts from this text are interlaced in the Shivering Sands (2016) film by Rohini Devasher. The Amateur Astronomers Association, Delhi is a registered NGO under the Under Societies Registration Act XXI of 1860. It consists of a mixed bag of astronomy enthusiasts dedicated to learning and popularizing astronomy in India. See: http://aaadelhi.org/ (accessed May 17, 2016). The Blue Marble is a famous photograph of the Earth, taken on December 7, 1972, by the crew of the Apollo 17 spacecraft, at a distance of about 45,000 kms. It is one of the most iconic, and among the most widely distributed images in human history. The Word for World Is Forest is a science fiction novella by Ursula K. Le Guin, first published in 1972 in the anthology Again, Dangerous Visions, and published as a separate book in 1976. Archaeologies of Future: Chaos and Coincidence exhibition was presented at Vis-a-Vis Experience Centre, New Delhi between 4 - 19 March, 2016. All images are courtesy of Rohini Devasher and Project 88, Mumbai.